Oh WOW, beauty. Excellent focus, amazing tones. Everything simply perfect. Hey, nobody shoots seagulls... jejeje� I actually like this one in its attentive serenity. Great photo and tones that are very nice in B&W. Excellent! He looks serious. Only complaint that this isn't primarily about the sand, but who cares. I'm glad you entered this. I love it. Nice capture with a good use of the narrow DOF to emphasis the bird and his presence on the narrow strip of in-focus sand. I might have cloned out the half a bokeh on the top right but that is a small nit. Great shot and processing. One of my favorites. On patrol for sure. 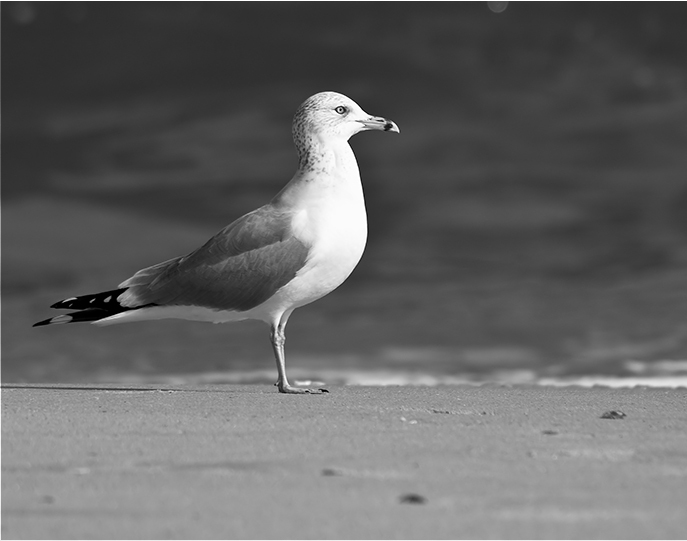 Love this shot, but feel it's more about the gull than the sand. Proudly hosted by Sargasso Networks. Current Server Time: 04/20/2019 09:04:47 PM EDT.